Discussion in 'Latest News' started by Lina, Dec 24, 2014. 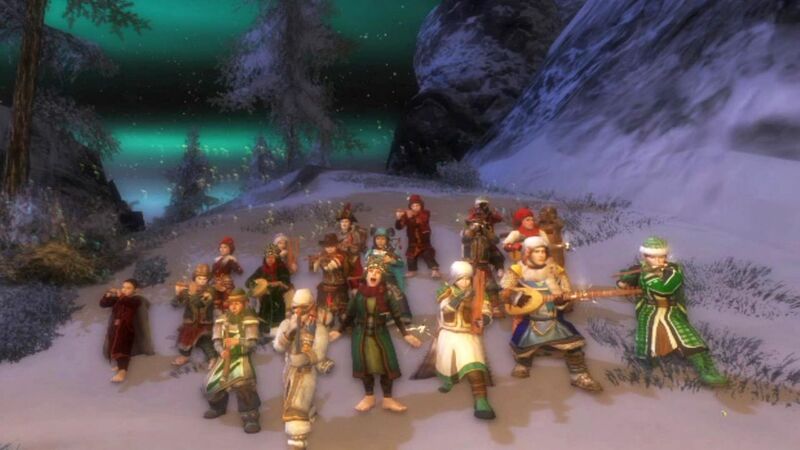 The hobbits in the Grand Order of the Lost Mathom wishes a grand and merry Yule to all good friends and aquaintances. Here is this year's Yule greeting video from the Laurelin hobbits too! Yule drawing time! This time, I had a lot of help from the hobbit roleplayers on Laurelin. Grand thanks to everyone who helped out in the making of the video, with acting, screenshots and good hobbit cheer! I had originally planned to mention each and every one of yer in the video credits, but there were simply too many. Also, I was afraid I might have missed one or two who had to leave during the video shoots. Know that all yer efforts were highly appreciated, though! The video is best enjoyed in full-screen and high definition. Enjoy! The hobbits of the Grand Order of the Lost Mathom would like to wish all our good friends and acquaintances a very merry Yule! We hope that yer will join in during these festivities, we would love to see yer there! In the meantime, we wish a grand and merry Yule to everyone! May yer always enjoy health, happiness and the comfort of a warm burrow with well-stocked larder. Lully, Rubellita, Tibba and 6 others like this. Miss Lina, this video is incredible! I love it. Thank you for creating it. Merry Yule, everyone! Thank you for being such amazing friends. Wonderful video, Lina! It put me perfectly in the Yuletime mood! Have a wonderful yule, each and everyone of you! Primrrose and Neti like this. I wish all the Grand Order Hobbits and all our wonderful friends a very merry Yule! May there be many Yule pies for everyone of you! Rubellita, Tibba, Nimelia and 4 others like this. And aye, have a grand time, everybody! What a lovely video indeed! Merry Yuletime to all! Merry Yule! May the new year be full of happiness for you all! A grand and lovely and happy new year to everyone! Celebrate with ale, port, cider, apple juice or whatever else yer enjoy! Aye, a hobbity year to everyone!